It’s cold outside and PACEP Is heating up!!! As we turn the page on 2018 and welcome 2019, we know the work of Emergency Physicians is never done. During the good times (holidays) and the bad times (tragedies and natural disasters), Emergency Physicians are the backbone of our health care system, 24.7.365. At PACEP, we are committed to helping our members complete their mission of taking care of the people of the Commonwealth anytime. For 2019, in order to advance our mission, PACEP has set the following legislative and regulatory goals. These include: fighting for fair reimbursement for emergency services, drafting and implementing common sense opioid regulations, and ensuring that the PA State Health and Safety regulations (Title 28) rewrite acknowledges the roles that Ankur A. Doshi, Emergency Physicians play in EDs and hospitals. Our EMS/Disaster committee is also MD, FACEP assisting in the EMS regulation rewrite. Finally, we are working with our health care PACEP President partners to combat rollbacks against physicians in the PA medical malpractice climate (more info here: https://www.pamedsoc.org/venue-rule-change/comment). Our members have been involved in many meetings locally and in Harrisburg to advance this agenda. And, there’s way more to go! Stay tuned! Our Board of Directors approved the 4 newest leaders in our College this month – 2 new Resident Board Members and 2 new Leadership Fellows. Welcome to Drs. Khammahavong, Tannenholtz, Olaf and Walls! Additionally, our Nominating Committee and Board of Directors have approved the slate for 2019 BOD Elections (www.pacep.net/governance.html). Please take some time to learn about the candidates and their visions for PACEP and then vote. The BOD serves as your advocate for EM in the state. Please vote! Finally, our PACEP SA 2019 is just around the corner! We will be gathering from April 10-12 in King of Prussia to learn, network and enjoy each other’s’ company. Some highlights include a top-notch slate of speakers on the theme: Providing Evidence-based Medicine at your Doorstep, our 2nd Annual Ultrasound-Guided Procedural Course (https://www.pacep.net/pacep-ultrasound-guided-procedural-course.html), and (for the first time in many years) AOA Credits for those needing them! Go here to register: http://www.cvent.com/events/pacep19-scientific-assembly/ event-summary-b10551cb8569424aaefc663962b7a3ae.aspx. 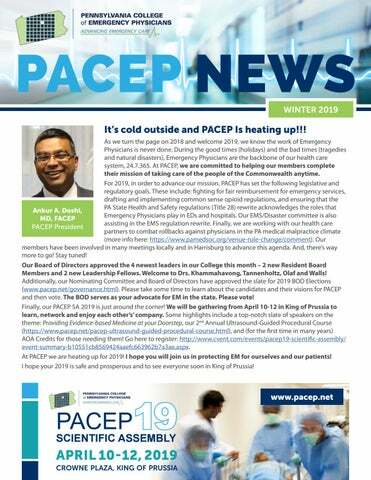 At PACEP we are heating up for 2019! I hope you will join us in protecting EM for ourselves and our patients! I hope your 2019 is safe and prosperous and to see everyone soon in King of Prussia! What the Area Offers: We welcome you to a community that emulates the values Milton Hershey instilled in a town that holds his name. Located in a safe family-friendly setting, Hershey, PA, our local neighborhoods boast a reasonable cost of living whether you prefer a more suburban setting or thriving city rich in theater, arts, and culture. Known as the home of the Hershey chocolate bar, Hershey’s community is rich in history and offers an abundant range of outdoor activities, arts, and diverse experiences. We’re conveniently located within a short distance to major cities such as Philadelphia, Pittsburgh, NYC, Baltimore, and Washington DC. FOR ADDITIONAL INFORMATION PLEASE CONTACT: Susan B. Promes, Professor and Chair, Department of Emergency Medicine c/o Heather Peffley, Physician Recruiter, Penn State Health Milton S. Hershey Medical Center 500 University Drive, MC A595, P O Box 855, Hershey PA 17033 Email: hpeffley@pennstatehealth.psu.edu or apply online at: hmc.pennstatehealth.org/careers/physicians Penn State Health is committed to affirmative action, equal opportunity and the diversity of its workforce. Equal Opportunity Employer – Minorities/Women/Protected Veterans/Disabled. Social Determinants of Health – A “Healthy Opportunity” for Emergency Medicine Emergency medicine has a long history of adopting the mantra, “anyone, anything, anytime” to describe our social compact of Chadd K. Kraus, DO, serving as healthcare’s DrPH, MPH, FACEP safety net. As healthcare costs and value-based care continue to dominate health policy, legislative, and regulatory discussions, the social determinants of health have taken center stage. Social determinants of health are defined by the World Health Organization (WHO) as “the conditions in which people are born, grow, live, work, and age.”(1) Some examples of social determinants include availability of stable housing, reliable transportation options, exposure to crime and violence, access to education, and food. (2) On the national level, there is a strong interest in addressing the social determinants of health, primarily as a way to control costs and manage utilization of health care services. As an example, for the past several years, some state Medicaid programs have used funding to assist individuals in finding and maintaining permanent housing. In a speech in late 2018, HHS Secretary Alex Azar said that that CMS through the Center for Medicare and Medicaid Innovations (CMMI) is exploring new initiatives that would allow hospitals and health systems to pursue additional partnerships with social service groups and other organizations to directly pay to address social determinants of health such as housing. (3) I recently attended a lecture that outlined state and federal health policy and solutions that states are undertaking. The speaker, Len M. Nichols, PhD, a health economist and policy expert, discussed re-thinking the social determinants of health as “healthy opportunities” rather than “determinants.” With my own interests in the intersection of clinical emergency medicine and public health, I was inspired by the concept of changing the focus from “determinants” to “opportunities” particularly because opportunities are something that we can all work together to create. We as emergency physicians and as the specialty of emergency medicine have a clear role to play as leaders in creating those “healthy opportunities” by defining and addressing the social determinants of health that impact our patients and their presentations to the ED. So how is emergency medicine creating “healthy opportunities” for our patients and our communities? Curious about getting involved in policy-setting at the national level? The PACEP Board of Directors is seeking interested members to join our Delegation to the 2019 ACEP Council to be held Friday and Saturday, October 25 and 26, 2019 in Denver, CO. This year, PACEP is allotted 18 councillors, as well as alternates. Any active PACEP member is eligible. We want to know your opinions and thoughts! A councillor/alternate councillor is a key participant in the leadership and development of ACEP policy and has the responsibility to voice the concerns of their (Pennsylvania) constituents on the floor of the Council meeting and in reference committees. Councillors can also express the will of their constituents by voting for or against resolutions and electing board members and Council officers. Councillors and alternates will be a part of PACEP’s resolution planning and writing efforts, discussion of and response to all other resolutions selected for review at the Council meeting, and onsite Pennsylvania Delegation events. Interested in serving on the 2019 PACEP Delegation? Have an idea for a 2019 Council resolution? Email a brief statement of interest to info@pacep.net by April 26, 2019. To learn more, visit the ACEP Council page. If you have any questions, contact Barbara Husic, Executive Director, at bhusic@pamedsoc.org. Allegheny Health Network Emergency Medicine Management (AHNEMM) is a joint venture formed by USACS and the Allegheny Health Network (AHN) to provide for the emergency medicine needs for hospitals that are part of AHN and others who partnered with the organization. It aligns physician, hospital and payor to do what’s right for patients and deliver high-quality, innovative and efficient models of care. Partnership in AHNEMM includes partnership in US Acute Care Solutions and access to both organizations’ resources. COMMITTEES WELLNESS COMMITTEE Before you know it, we will be gathering in King of Prussia for Scientific Assembly 2019 and the PACEP Wellness Committee has a variety of activities planned again this year for your enjoyment. Join us for Yoga with instructor Lisa McBride early mornings on Thursday April 11 and Friday April 12 in the Devon Room. Stretch and stimulate your mind and body before sitting in the lecture hall all day. Visit the Recharge Room where you can unwind from the day in our relaxing environment. Stop by the Wellness Booth in the exhibit hall. We will be giving out some much wanted wellness swag. We will also have the Wellness inspiration board again. Post what you do for wellness or get some ideas posted by others on the board. If you are interested in joining the Wellness Committee, sign-ups will be available at the booth. Adult coloring seems to be one of the latest trends. Much like mediation, when you color, your brain switches off from your other thoughts and focuses on the task in the moment. You reach a state of calm that relieves you from the daily stresses and nonstop thinking. A study published in the Art Therapy: Journal of the American Art Therapy Association 22(2) pp. 81-85 provides support that coloring mandalas or geometric patterns actually does help lower stress and anxiety levels. Because coloring requires repetition and attention to detail, you can focus on the activity instead of your other worries. Mindfulness keeps us committed to the present which occurs with coloring. PACEPâ&#x20AC;&#x2122;s Wellness Committee promotes the health and wellness of emergency physicians through education and initiatives that encourage habits of wellness, increase awareness of factors and resources contributing to well-being, inspire and empower individuals to take responsibility for their own health and support a sense of community. If you are interested in becoming a Wellness Committee member, please email info@pacep.net. PEP-PAC gives us a chance to support legislators, many of whom have supported emergency medicine in the past. We certainly will be asking for their support for the next two years. After any election, there are new freshman legislators to educate. Most elected officials don’t have a medical background and don’t understand complex issues like out of network billing, tort reform, the opioid crisis, scope of practice, psychiatric boarding and bed availability to name just a few. We have many opponents in the Capitol. These include the trial lawyers, insurance lobbyists, sometimes the Hospital Association of Pennsylvania, possibly other specialties, special interest groups, etc. It is imperative that we continue to raise money to advance meaningful legislation in our State. There is so much misinformation that we have to address. Thank you for your past, present and future support. When we work together, there is nothing, we can’t accomplish. LEGISLATIVE UPDATE Milliron & Goodman Government Relations On Tuesday, January 1st, the Pennsylvania General Assembly met to convene the 203rd legislative session. The 2019-2020 session brings 50 new members to the House and Senate. Below are the lists of the new committee chairs. Relevant committees are highlighted. voice some concerns over some of the changes in the regulations, particularly those pertaining to victims of sexual assault and micro-hospitals. PACEP also offered to come to the Department of Health in person to review the regulations and provide further comment and feedback on the draft, which did happen on Wednesday January 3. Itâ&#x20AC;&#x2122;s important to remember, while we are working on these regulations, the regulatory process is much longer and very different than the legislative process and we are still in the very early stages of the process. The hospital regulations have not yet been made public. It is our expectation that these regulations will be available to the public for a comment period sometime this spring. The publishing of the proposed regulations signals the official start of the regulatory process, which can take well over two years to complete. While it is still very early in the session and most bills have not yet been introduced, we anticipate that many of the same bills from last session will return for the 2019-2020 session. We are already tracking cosponsorship memos for things like involuntary commitment, regulation of fentanyl, and taxation on opioids. Tina Pickett (R-Bradford) has filed a cosponsorship memo on her intent to introduce legislation. PACEP is actively engaged in the discussions with lawmakers and is working with other hospital-based specialties. Pennsylvanians should be able to use the closest and most appropriate emergency department when they have an acute need. No patient at a time of medical crisis should have to worry about insurance network coverage. At the same time, insurance companies should be required to pay fair and reasonable reimbursement rates to emergency care providers, regardless of whether they are considered in- or out-of-network. PACEP continues to advocate for transparent and objective reimbursement criteria (e.g. Fair Health). The good news â&#x20AC;&#x201C; lawmakers are interested in learning more about the solutions proposed and concerns raised by the provider community. The state House Insurance Committee, chaired by Pickett, is planning an informational meeting with Fair Health in February. In addition, the Committee is scheduling an informational meeting with stakeholders, including PACEP and other medical specialties, on surprise balance billing. There is also discussion on an informational meeting with the state Department of Health to talk about network adequacy and their standards for determining network adequacy. PACEP agrees that patients should not receive surprise bills when care is provided unknowingly by an out-of-network provider. Emergency physicians want to be part of the solution and work with the Legislature to avoid unintended consequences. Please stay alert for updates. In the interim, we encourage you to continue your discussions with your local legislators on this important issue. CONTACT If you have any questions regarding this legislative update or would like to get involved, please do not hesitate to contact us at 717.232.5322. We have an open door policy. Get the Best of Both Worlds. Work. Your work is your passion. But it’s not your whole life. Join a system that supports your need to balance work and home life. You can find great dining, art, entertainment, and culture in our cities, as well as peace and quiet in our rural areas. With opportunity for advancement and great schools and colleges nearby, it’s a great place to grow your career and your family. Contact Rachel Jones, MBA FASPR Office: 717-231-8796 rajones@pinnaclehealth.org Teaching and academic director roles available. EOE. UPMC Pinnacle is an Equal Opportunity Employer. Notice of Proposed Bylaw Change One of the duties of the PACEP Secretary is to review our organization’s bylaws as appropriate, and to suggest changes when needed. With that in mind, I reviewed Article VI F. Richard Heath, MD Board of Directors, Section PACEP Secretary 4A - Nomination and Election, of the bylaws. The paragraph is unclear on several points, including: •	Is it the Nominating Committee, the Board or Directors, or both that must represent (as far as practical) all geographic sections of the Chapter? •	What happens if a designated member of the Nominating Committee is unable/unwilling to serve? •	How is “written” to be interpreted? •	Which nominees require petitioner signatures? In the interest of clarifying the process, and with specific attention to these points, I proposed to the Board of Directors a revision. The PACEP Board of Directors has reviewed the proposed language and has recommended that it be approved by a vote of the membership. We will hold this vote at the Annual Business Meeting on April 12, 2019, held in conjunction with the Scientific Assembly. Passing the amendment will require an affirmative vote of two-thirds of the members present at that meeting. Should you have questions or concerns about this, please contact me at secretary@pacep.net. CURRENT BY-LAW (2017) ARTICLE VI - Board of Directors Section 4A - Nomination and Election. A Nominating Committee for candidates to the Board of Directors (representing as far as practical, all geographical sections of the Chapter) shall be appointed by the Board of Directors and chaired by the Immediate Past President and shall include but not limited to the President-Elect, current President, and past Presidents and other members at the discretion of the Immediate Past President, and shall present a list of nominees to the Board of Directors at least ninety (90) days prior to the date of the annual meeting. Nominees for the Board of Directors must be regular members in good standing. Nominations may be made by any other voting member of the Chapter by submitting the proposed candidate’s name in writing to the Secretary no later than ninety (90) days prior to the annual meeting. The nomination must be accompanied by a copy of the proposed candidate’s curriculum vitae, written acceptance of the nomination, and the signatures of fifteen (15) voting member petitioners. Directors shall be elected by a plurality of the members voting. Write-in votes are not allowed. Nominations from the floor at the time of the elections are not allowed. *** PROPOSED BYLAW CHANGE ARTICLE VI - Board of Directors Section 4A – Nomination and Election. A Nominating Committee for candidates to the Board of Directors shall be appointed by the Board of Directors. The committee will be chaired by the Immediate Past President and shall include the President-Elect and current President. Past Presidents and other members may be included at the discretion of the Immediate Past President. If any designated member of the Nominating Committee is unable to serve, the Board of Directors shall appoint a substitute. The committee shall present a list of nominees to the Board of Directors at least ninety (90) days prior to the date of the annual meeting. The nominees shall represent, as far as practical, the diversity of the Chapter. Nominees for the Board of Directors must be active members in good standing. Any active member of the Chapter may submit the names of potential nominees to the Nominating Committee. Nominations may also be made by any other member of the Chapter by submitting the candidate’s name in writing to the Secretary no later than ninety (90) days prior to the annual meeting. Such nominations must be accompanied by a copy of the candidate’s CV, written acceptance of the nomination, and the written signatures of fifteen (15) member petitioners. Candidates must be active members in good standing. All listed requirements for nomination may be transmitted in hard copy or electronic format. Directors shall be elected by a plurality of the members voting. Write-in votes are not allowed. Nominations from the floor at the time of the elections are not allowed. MEMBERS in the news Dr. Kraus wore his white coat while attending a press event at the State Capitol Rotunda on Wednesday, January 30, 2019 to show opposition to the proposed rule change to Pennsylvania Rule of Civil Procedure 1006. The Civil Procedural Rules Committee proposed a change that would revise the venue rule: the county in which medical malpractice case may be filed. PACEP joined the Pennsylvania Medical Society’s movement through stakeholder involvement to flood the Committee with comments by the February 22, 2019 deadline date. 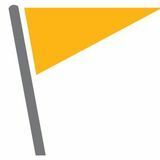 The Pennsylvania Medical Society set up a portal where you can send your comments to the Committee: https://www.pamedsoc.org/venue-rule-change/comment. Representative Mike Turzai, Speaker of the House, along with other legislators, physicians, and patients at the State Capitol Rotunda on Wednesday January 30, 2019. Dr. Kraus is standing behind Rep. Turzai to the left. Doctors Doshi and Venkat met with Mike Turzai, Speaker of the Pennsylvania House of Representatives on Monday February 2, 2019 to discuss legislative healthcare agenda for the upcoming session. They discussed PACEP’s legislative priorities and offered assistance on those issues. Friday, March 8, 2019 Harrisburg Wednesday, April 10 – Friday, April 12, 2019 Crowne Plaza, Valley Forge Wednesday, April 10, 2019 Crowne Plaza, Valley Forge Wednesday, April 10, 2019 Crowne Plaza, Valley Forge Wednesday, April 10, 2019 Crowne Plaza, Valley Forge Thursday, April 11, 2019 TBD, Valley Forge Friday, April 12, 2019 Crowne Plaza, Valley Forge Sunday, May 5 – Wednesday, May 8, 2019 Washington, DC PACEP Board of Director Meetings are open to anyone in membership to attend. 2019 Warm Hand-off Summits Please check www.pacep.net/events.html for locations. Funding for this initiative was made possible (in part) by grant no. 1H79TI080816 from SAMHSA. The views expressed in written conference materials or publications and by speakers and moderators do not necessarily reflect the official policies of the Department of Health and Human Services; nor does mention of trade names, commercial practices, or organizations imply endorsement by the U.S. Government This activity has been planned and implemented in accordance with the accreditation requirements and policies of the Accreditation Council for Continuing Medical Education (ACCME) through the joint providership of the American College of Emergency Physicians and the Illinois Chapter of Emergency Physicians. The American College of Emergency Physicians is accredited by the ACCME to provide continuing medical education for physicians. The American College of Emergency Physicians designates this live activity for a maximum of 1.0 AMA PRA Category 1 CreditTM. Physicians should claim only the credit commensurate with the extent of their participation in the activity. We fight the good fight. At USACS we have one mission: to care for patients. Every full-time physician in our group becomes an owner in our group, creating a legendary culture and camaraderie you can feel. That’s true whether you’re working in the ED, or getting clobbered by a snowball on a ski trip with your fellow comrades. Discover why USACS is the fastest growing physician-owned group in the country. Check out career opportunities at USACS.com.